This article is about the social and political aspects of hunger. For the physical sensation, see Hunger (motivational state). For the physical extremes, see Starvation and Famine. For other uses, see Hunger (disambiguation). "Hungry" redirects here. For other uses, see Hungry (disambiguation). In politics, humanitarian aid, and social science, hunger is a condition in which a person, for a sustained period, is unable to eat sufficient food to meet basic nutritional needs. So in the field of hunger relief, the term hunger is used in a sense that goes beyond the common desire for food that all humans experience. Throughout history, portions of the world's population have often suffered sustained periods of hunger. In many cases, this resulted from food supply disruptions caused by war, plagues, or adverse weather. In the decades following World War II, technological progress and enhanced political cooperation suggested it might be possible to substantially reduce the number of people suffering from hunger. While progress was uneven, by 2015 the threat of extreme hunger subsided for many of the world's people. According to figures published by the FAO in 2018 however, the number of people suffering from chronic hunger has been increasing over the last three years. This is both as a percentage of the world's population, and in absolute terms, with about 821 million afflicted with hunger in 2017. While most of the world's hungry people continue to live in Asia, much of the increase in hunger since 2015 occurred in Africa and South America. The FAO's 2017 report discussed three principal reasons for the recent increase in hunger: climate, conflict, and economic slowdowns. The 2018 report focused on extreme weather as a primary driver of the increase in hunger, finding that the increases were especially severe in countries where the agricultural systems were most sensitive to extreme variations in weather. Many thousands of organisations are engaged in the field of hunger relief; operating at local, national, regional or international levels. Some of these organisations are dedicated to hunger relief, while others may work in a number of different fields. The organisations range from multilateral institutions, to national governments, to small local initiatives such as independent soup kitchens. Many participate in umbrella networks that connect together thousands of different hunger relief organisations. At the global level, much of the world's hunger relief efforts are coordinated by the UN, and geared towards achieving the 2030 Sustainable Development Goal for "Zero hunger". Malnutrition results from "deficiencies, excesses or imbalances in the consumption of macro- and/or micro-nutrients." In the FAO definition, all hungry people suffer from malnutrition, but people who are malnourished may not be hungery. They may get suffient raw calories to avoid hunger, but lack essential micro nutrients, or they may even consume an excess of raw calories and hence suffer from obeisity. Food insecurity occurs when people are at risk, or worried about, not being able to meet their preferences for food, including in terms of raw calories and nutritional value. In the FAO definition, all hungry people are food insecure, but not all food insecure people are hungry (though there is a very strong overlap between hunger and severe food insecurity.). The FAO have reported that food insecurity quite often results in simultaneous stunted growth for children, and obesity for adults. Not all of the many thousands of organisations in the hunger relief field use the FAO definition of hunger. Some use a broader definition that overlaps more fully with malnutrition. The alternative definitions do however tend to go beyond the commonly understood meaning of hunger as a painful or uncomfortable motivational condition; the desire for food is something that all humans frequently experience, even the most affluent, and is not in itself a social problem. Hunger pangs can be made worse by irregular meals. People who cannot afford to eat more than once a day sometimes refuse one-off additional meals, because if they do not eat at around the same time on the next days, they may suffer extra severe hunger pangs. Older people may feel less violent stomach contractions when they get hungry, but still suffer the secondary effects resulting from low food intake: these include weakness, irritability and decreased concentration. Prolonged lack of adequate nutrition also causes increased susceptibility to disease and reduced ability for the body to self heal. The United nations publish an annual report on the state of food security and nutrition across the world. Led by the FAO, the 2018 report was joint authored by four other UN agencies: the WFP, IFAD, WHO and UNICEF. The FAO's yearly report provides a statistical overview on the prevalence of hunger around the world, and is widely considered the main global reference for tracking hunger. No simple set of statistics can ever fully capture the multi demensional nature of hunger however. Reasons include that the FAO's key metric for hunger, "undernourishment", is defined solely in terms of dietary energy availability – disregarding micro-nutrients such as vitamins or minerals. Second, the FAO uses the energy requirements for minimum activity levels as a benchmark; many people would not count as hungry by the FAO's measure yet still be eating too little to undertake hard manual labour, which might be the only sort of work available to them. Thirdly, the FAO statistics do not always reflect short-term undernourishment. An alternative measure of hunger across the world is the Global Hunger Index (GHI). Unlike the FAO's measure, the GHI defines hunger in a way that goes beyond raw calorie intake, to include for example ingestion of micronutrients. GDI is a multidimensional statistical tool used to describe the state of countries’ hunger situation. The GHI measures progress and failures in the global fight against hunger. The GHI is updated once a year. The data from the 2015 report showed that Hunger levels have dropped 27% since 2000. Fifty two countries remain at serious or alarming levels. In addition to the latest statistics on Hunger and Food Security, the GHI also features different special topics each year. The 2015 report include an article on conflict and food security. Throughout history, the need to aid those suffering from hunger has been commonly, though not universally, recognized. The philosopher Simone Weil wrote that feeding the hungry when you have resources to do so is the most obvious of all human obligations. She says that as far back as Ancient Egypt, many believed that people had to show they had helped the hungry in order to justify themselves in the afterlife. 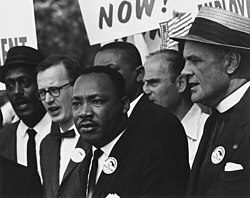 Weil writes that Social progress is commonly held to be first of all, "...a transition to a state of human society in which people will not suffer from hunger." Social historian Karl Polanyi wrote that before markets became the world's dominant form of economic organization in the 19th century, most human societies would either starve all together or not at all, because communities would invariably share their food. While some of the principles for avoiding famines had been laid out in the very first book of the Holy Bible, they were not always understood. Historical hunger relief efforts were often largely left to religious organisations and individual kindness. Even up to early modern times, political leaders often reacted to famine with bewilderment and confusion. From the first age of globalization, which began in the 19th century, it became more common for the elite to consider problems like hunger in global terms. However, as early globalization largely coincided with the high peak of influence for classical liberalism, there was relatively little call for politicians to address world hunger. In the late nineteenth and early twentieth century, the view that politicians ought not to intervene against hunger was increasingly challenged by campaigning journalists. There were also more frequent calls for large scale intervention against world hunger from academics and politicians, such as U.S. President Woodrow Wilson. Funded both by the government and private donations, the U.S. was able to dispatch millions of tons of food aid to European countries during and in the years immediately after WWI, organised by agencies such as the American Relief Administration. 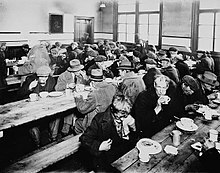 Hunger as an academic and social topic came to further prominence in the U.S. thanks to mass media coverage of the issue as a domestic problem during the Great Depression. While there had been increasing attention to hunger relief from the late 19th century, Dr David Grigg has summarised that prior to the end of World war II, world hunger still received relatively little academic or political attention; whereas after 1945 there was an explosion of interest in the topic. After World War II, a new international politico-economic order came into being, which was later described as Embedded liberalism. For at least the first decade after the war, the United States, then by far the period's most dominant national actor, was strongly supportive of efforts to tackle world hunger and to promote international development. It heavily funded the United Nation's development programmes, and later the efforts of other multilateral organizations like the International Monetary Fund (IMF) and the World Bank (WB). The newly established United Nations became a leading player in co-ordinating the global fight against hunger. The UN has three agencies that work to promote food security and agricultural development: the Food and Agriculture Organization (FAO), the World Food Programme (WFP) and the International Fund for Agricultural Development (IFAD). FAO is the world's agricultural knowledge agency, providing policy and technical assistance to developing countries to promote food security, nutrition and sustainable agricultural production, particularly in rural areas. WFP's key mission is to deliver food into the hands of the hungry poor. The agency steps in during emergencies and uses food to aid recovery after emergencies. Its longer term approaches to hunger helps the transition from recovery to development. IFAD, with its knowledge of rural poverty and exclusive focus on poor rural people, designs and implements programmes to help those people access the assets, services and opportunities they need to overcome poverty. Following successful post WWII reconstruction of Germany and Japan, the IMF and WB began to turn their attention to the developing world. A great many civil society actors were also active in trying to combat hunger, especially after the late 1970s when global media began to bring the plight of starving people in places like Ethiopia to wider attention. Most significant of all, especially in the late 1960s and 70s, the Green revolution helped improved agricultural technology propagate throughout the world. The United States began to change its approach to the problem of world hunger from about the mid 1950s. Influential members of the administration became less enthusiastic about methods they saw as promoting an over reliance on the state, as they feared that might assist the spread of communism. By the 1980s, the previous consensus in favour of moderate government intervention had been displaced across the western world. The IMF and World Bank in particular began to promote market-based solutions. In cases where countries became dependent on the IMF, they sometimes forced national governments to prioritize debt repayments and sharply cut public services. This sometimes had a negative effect on efforts to combat hunger. Increased use of irrigation played a major role in the Green Revolution. Organizations such as Food First raised the issue of food sovereignty and claimed that every country on earth (with the possible minor exceptions of some city-states) has sufficient agricultural capacity to feed its own people, but that the "free trade" economic order, which from the late 1970s to about 2008 had been associated with such institutions as the IMF and World Bank, had prevented this from happening. The World Bank itself claimed it was part of the solution to hunger, asserting that the best way for countries to break the cycle of poverty and hunger was to build export-led economies that provide the financial means to buy foodstuffs on the world market. However, in the early 21st century the World Bank and IMF became less dogmatic about promoting free market reforms. They increasingly returned to the view that government intervention does have a role to play, and that it can be advisable for governments to support food security with policies favourable to domestic agriculture, even for countries that do not have a Comparative advantage in that area. As of 2012, the World Bank remains active in helping governments to intervene against hunger. Until at least the 1980s—and, to an extent, the 1990s—the dominant academic view concerning world hunger was that it was a problem of demand exceeding supply. Proposed solutions often focused on boosting food production, and sometimes on birth control. There were exceptions to this, even as early as the 1940s, Lord Boyd-Orr, the first head of the UN's FAO, had perceived hunger as largely a problem of distribution, and drew up comprehensive plans to correct this. Few agreed with him at the time, however, and he resigned after failing to secure support for his plans from the US and Great Britain. In 1998, Amartya Sen won a Nobel Prize in part for demonstrating that hunger in modern times is not typically the product of a lack of food. Rather, hunger usually arises from food distribution problems, or from governmental policies in the developed and developing world. It has since been broadly accepted that world hunger results from issues with the distribution as well as the production of food. Sen's 1981 essay Poverty and Famines: An Essay on Entitlement and Deprivation played a prominent part in forging the new consensus. In 2007 and 2008, rapidly increasing food prices caused a global food crisis, increasing the numbers suffering from hunger by over a hundred million. Food riots erupted in several dozen countries; in at least two cases, Haiti and Madagascar, this led to the toppling of governments. A second global food crisis unfolded due to the spike in food prices of late 2010 and early 2011. Fewer food riots occurred, due in part to greater availability of food stock piles for relief. However, several analysts argue the food crisis was one of the causes of the Arab Spring. In the early 21st century, the attention paid to the problem of hunger by the leaders of advanced nations such as those that form the G8 had somewhat subsided. Prior to 2009, large scale efforts to fight hunger were mainly undertaken by governments of the worst affected countries, by civil society actors, and by multilateral and regional organizations. In 2009, Pope Benedict published his third encyclical, Caritas in Veritate, which emphasised the importance of fighting against hunger. The encyclical was intentionally published immediately before the July 2009 G8 Summit to maximise its influence on that event. At the Summit, which took place at L'Aquila in central Italy, the L'Aquila Food Security Initiative was launched, with a total of US$22 billion committed to combat hunger. Food prices fell sharply in 2009 and early 2010, though analysts credit this much more to farmers increasing production in response to the 2008 spike in prices, than to the fruits of enhanced government action. However, since the 2009 G8 summit, the fight against hunger became a high-profile issue among the leaders of the worlds major nations, and was a prominent part of the agenda for the 2012 G-20 summit. In April 2012, the Food Assistance Convention was signed, the world's first legally binding international agreement on food aid. The May 2012 Copenhagen Consensus recommended that efforts to combat hunger and malnutrition should be the first priority for politicians and private sector philanthropists looking to maximize the effectiveness of aid spending. They put this ahead of other priorities, like the fight against malaria and AIDS. Also in May 2012, U.S. President Barack Obama launched a "new alliance for food security and nutrition"—a broad partnership between private sector, governmental and civil society actors—that aimed to "...achieve sustained and inclusive agricultural growth and raise 50 million people out of poverty over the next 10 years." The UK's prime minister David Cameron held a hunger summit on 12 August, the last day of the 2012 Summer Olympics. The fight against hunger has also been joined by an increased number of regular people. While folk throughout the world had long contributed to efforts to alleviate hunger in the developing world, there has recently been a rapid increase in the numbers involved in tackling domestic hunger even within the economically advanced nations of the Global North. This had happened much earlier in North America than it did in Europe. In the US, the Reagan administration scaled back welfare the early 1980s, leading to a vast increase of charity sector efforts to help Americans unable to buy enough to eat. According to a 1992 survey of 1000 randomly selected US voters, 77% of Americans had contributed to efforts to feed the hungry, either by volunteering for various hunger relief agencies such as food banks and soup kitchens, or by donating cash or food. Europe, with its more generous welfare system, had little awareness of domestic hunger until the food price inflation that began in late 2006, and especially as austerity-imposed welfare cuts began to take effect in 2010. Various surveys reported that upwards of 10% of Europe's population had begun to suffer from food insecurity. Especially since 2011, there has been a substantial increase in grass roots efforts to help the hungry by means of food banks, within both the UK and continental Europe. By July 2012, the 2012 US drought had already caused a rapid increase in the price of grain and soy, with a knock on effect on the price of meat. As well as affecting hungry people in the US, this caused prices to rise on the global markets; the US is the world's biggest exporter of food. This led to much talk of a possible third 21st century global food crisis. The Financial Times reported that the BRICS may not be as badly affected as they were in the earlier crises of 2008 and 2011. However, smaller developing countries that must import a substantial portion of their food could be hard hit. The UN and G20 has begun contingency planning so as to be ready to intervene if a third global crisis breaks out. By August 2013 however, concerns had been allayed, with above average grain harvests expected from major exporters, including Brazil, Ukraine and the U.S. 2014 also saw a good worldwide harvest, leading to speculation that grain prices could soon begin to fall. In an April 2013 summit held in Dublin concerning Hunger, Nutrition, Climate Justice, and the post 2015 MDG framwework for global justice, Ireland's President Higgins said that only 10% of deaths from hunger are due to armed conflict and natural disasters, with ongoing hunger being both the "greatest ethical failure of the current global system" and the "greatest ethical challenge facing the global community." $4.15 billion of new commitments were made to tackle hunger at a June 2013 Hunger Summit held in London, hosted by the governments of Britain and Brazil, together with The Children's Investment Fund Foundation. Despite the hardship caused by the 2007–2008 financial crisis and global increases in food prices that occurred around the same time, the UN's global statistics show close to year on year reductions in the numbers suffering from hunger around the world. By 2018 however, evidence had mounted that this progress seems to have gone into reverse over the last three years, with the numbers suffering from hunger increasing both in absolute terms, and even as a percentage of the world's population. Many thousands of hunger relief organisations exist across the world. Some but not all are entirely dedicated to fighting hunger. They range from independent soup kitchens that serve only one locality, to global organisations. Organisations working at the global and regional level will often focus much of their efforts on helping hungry communities to better feed themselves, for example by sharing agricultural technology. With some exceptions, organisations that work just on the local level tend to focus more on providing food directly to hungry people. Many of the entities are connected by a web of national, regional and global alliances that help them share resources, knowledge, and coordinate efforts. The United Nations is central to global efforts to relieve hunger, most especially through the FAO, and also via other agencies: such as WFP, IFAD, WHO and UNICEF. The FAO's EndingHunger campaign is an online communication campaign aimed at raising awareness of the hunger problem. It has created viral videos depicting celebrities voicing their anger about the large number of hungry people in the world. After the Millennium Development Goals expired in 2015, the Sustainable Development Goals (SDGs) became key objectives to shape the world's response to development challenges such as hunger. In particular Goal 2: Zero Hunger sets globally agreed targets to end hunger, achieve food security and improved nutrition and promote sustainable agriculture. Various targets and indicators are associated to this objective. The first target address directly hunger and the second malnutrition. Others targets are partly instrumental to reduce hunger such as increasing agricultural productivity and incomes of small scale food producers (2.3), sustainable food production systems and resilient agricultural practices (2.4) and genetic diversity of seeds and access to "arising benefits arising from the utilization of genetic resources and associated traditional knowledge" (2.5) United Nations Department of Economic and Social Affaires. "Goal 2 .:. Sustainable Development Knowledge Platform". Sustainable Development Knowledge Platform. United Nations. Retrieved 6 October 2018. . Other targets (2.A, 2.B and 2.C) are means of implementation to facilitate 2.1-2.5 targets. A report by the International Food Policy Research Institute (IFPRI) of 2013 argued that the emphasis of the SDGs should be on eliminating hunger and under-nutrition, rather than on poverty, and that attempts should be made to do so by 2025 rather than 2030. The argument is based on an analysis of experiences in China, Vietnam, Brazil, and Thailand and the fact that people suffering from severe hunger face extra impediments to improving their lives, whether it be by education or work. Three pathways to achieve this were identified: 1) agriculture-led; 2) social protection- and nutrition- intervention-led; or 3) a combination of both of these approaches. Much of the world's reigional alliances are located in Africa. For example, the Alliance for Food Sovereignty in Africa or the Alliance for a Green Revolution in Africa. Examples of hunger relief organisations that operate on the national level include The Trussell Trust in the U.K. and Feeding America in the U.S.
A food bank or foodbank is a non-profit, charitable organization that aids in the distribution of food to those who have difficulty purchasing enough to avoid hunger. Food banks tend to run on different operating models depending on where they are located. In the U.S., Australia, and to some extent in Canada, foodbanks tend to perform a warehouse type function, storing and delivering food to front line food orgs, but not giving it directly to hungry peoples themselves. In much of Europe and elsewhere, food banks operate on the front line model, where they hand out parcels of uncooked food direct to the hungry, typically giving them enough for several meals which they can eat in their homes. In the U.S and Australia, establishments that hand out uncooked food to individual people are instead called food pantries, food shelves or food closets'. In Less Developed Countries, there are charity-run food banks that operate on a semi-commercial system that differs from both the more common "warehouse" and "frontline" models. In some rural LDCs such as Malawi, food is often relatively cheap and plentiful for the first few months after the harvest, but then becomes more and more expensive. Food banks in those areas can buy large amounts of food shortly after the harvest, and then as food prices start to rise, they sell it back to local people throughout the year at well below market prices. Such food banks will sometimes also act as centres to provide small holders and subsistence farmers with various forms of support. A soup kitchen, meal center, or food kitchen is a place where food is offered to the hungry for free or at a below market price. Frequently located in lower-income neighborhoods, they are often staffed by volunteer organizations, such as church or community groups. Soup kitchens sometimes obtain food from a food bank for free or at a low price, because they are considered a charity, which makes it easier for them to feed the many people who require their services. Local establishments calling themselves "food banks" or "soup kitchens" are often run either by Christian churches or less frequently by secular civil society groups. Other religions carry out similar hunger relief efforts, though sometimes with slightly different methods. For example, in the Sikh tradition of Langar, food is served to the hungry direct from Sikh temples. There are exceptions to this, for example in the UK Sikhs run some of the food banks, as well as giving out food direct from their Gurdwara's. In both developing and advanced countries, parents sometimes go without food so they can feed their children. Women, however, seem more likely to make this sacrifice than men. World Bank studies consistently find that about 60% of those who are hungry are female. The apparent explanation for this imbalance is that, compared to men, women more often forgo meals in order to feed their children. Older sources sometimes claim this phenomenon is unique to developing countries, due to greater sexual inequality. More recent findings suggested that mothers often miss meals in advanced economies too. For example, a 2012 study undertaken by Netmums in the UK found that one in five mothers sometimes misses out on food to save their children from hunger. In several periods and regions, gender has also been an important factor determining whether or not victims of hunger would make suitable examples for generating enthusiasm for hunger relief efforts. James Vernon, in his Hunger: A Modern History, wrote that in Britain before the 20th century, it was generally only women and children suffering from hunger who could arouse compassion. Men who failed to provide for themselves and their families were often regarded with contempt. This changed after World War I, where thousands of men who had proved their manliness in combat found themselves unable to secure employment. Similarly, female gender could be advantageous for those wishing to advocate for hunger relief, with Vernon writing that being a woman helped Emily Hobhouse draw the plight of hungry people to wider attention during the Second Boer War. ^ a b c d e f g William A Dando, ed. (2012). "passim, see esp Introduction; Historiography of Food, Hunger and famine; Hunger and Starvation". Food and Famine in the 21st Century: Vol 1, Topics and Issues. ABC-CLIO. ISBN 1598847309. ^ "FAO Statistical Yearbook 2012: Part 2 Hunger dimensions" (PDF). FAO. 2012. Retrieved 27 December 2018. ^ a b c d e f g h "The state of food security and nutrition in the world (2018)" (PDF). FAO. 11 September 2018. Retrieved 27 December 2018. ^ a b c d "An Introduction to the Basic Concepts of Food Security" (PDF). FAO. 2008. Retrieved 27 December 2018. ^ a b David Model (30 October 2012). "Britain's hidden hunger". BBC. Retrieved 4 November 2012. ^ Carol Kop (11 February 2009). "The Hunger Hormone". CBS News. Retrieved 7 November 2012. ^ K. von Grebmer, J. Bernstein, A. de Waal, N. Prasai, S. Yin, Y. Yohannes: 2015 Global Hunger Index - Armed Conflict and the Challenge of Hunger. Bonn, Washington D. C., Dublin: Welthungerhilfe, IFPRI, and Concern Worldwide. October 2015. ^ Karl Polanyi (2002) . "chpt. 4". The Great Transformation. Beacon Press. ISBN 978-0-8070-5643-1. ^ For further info see Hunger in the United Kingdom#Attitudes towards hunger relief. ^ There were many exceptions. For example, in Hunger: A Modern History (2007), James Vernon describes dozens of 18th and 19th century campaigners who spoke in favor of hunger relief. ^ As many individuals struggled for food, the same agricultural industries were suddenly producing large surpluses as means of increased production to counter the drop in demand from the European markets. This increased output was meant to ease the growing debt levels, however domestic demand could not keep up with prices. Instead, what is often called "the paradox of want amid plenty," agricultural surpluses and large demand simply did not fit together, causing the Hoover administration to buy large amounts of product, such as grain, to stabilize prices. Initially refusing to further compromise the distressed price levels, political pressure from starving families across the country forced Congress to reconsider. 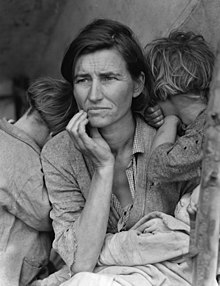 With large deposits of grain already wasting away in government possession, the only political move left was to begin a process of donations to the hungry from the Farm Board, a federal oversight created in 1929 to promote the sale and stabilization of agricultural products. Instead of hunger being a reason for the allocation of large grain surpluses, waste became the eventual driving force. ^ a b c James Vernon (2007). "Chpts. 1-3". Hunger: A Modern History. Harvard University Press. ISBN 0674026780. ^ a b c d e f David Grigg (1981). "The historiography of hunger: changing views on the world food problem 1945–1980". Transactions of the Institute of British Geographers. NS. 6 (3): 279–292. Before 1945 very little academic or political notice was taken of the problem of world hunger, since 1945 there has been a vast literature on the subject. ^ Charles Creighton (2010) . "Chapt. 1". History of Epidemics in Britain. Cambridge University Press. ISBN 114494760X. ^ Janet Poppendieck (1995). Eating Agendas. Aldine Transaction. ISBN 978-0-202-30508-0. ^ a b c d e John R. Butterly and Jack Shepherd (2010). Hunger: The Biology and Politics of Starvation. Dartmouth College. ISBN 1584659262. ^ a b c "Food Price Volatility a Growing Concern, World Bank Stands Ready to Respond". World Bank. 30 March 2012. Retrieved 31 July 2012. ^ Caroline Thomas and Tony Evans (2010). ""Poverty, development and hunger"". In John Baylis, Steve Smith and Patricia Owens (ed.). The Globalization of World Politics. Oxford University press. ISBN 0199569096. ^ a b c Joanna Rea (25 May 2012). "2012 G8 summit – private sector to the rescue of the world's poorest?". The Guardian. Retrieved 3 August 2012. ^ Janet Poppendieck (1999). "Introduction, Chpt 1". Sweet Charity? : Emergency Food and the End of Entitlement. Penguine. ISBN 0140245561. ^ "A million hungry children in the UK". Yahoo!. 12 July 2012. Archived from the original on 20 July 2012. Retrieved 31 July 2012. ^ Charlie Cooper (6 April 2012). "Look back in hunger: Britain's silent, scandalous epidemic". The Guardian. Retrieved 16 April 2012. ^ Rowenna Davis (12 May 2012). "The rise and rise of the food bank". New Statesman. Retrieved 31 July 2012. ^ Michael D. Higgins (15 April 2013). 20130415 Hunger • Nutrition • Climate Justice - Michael D Higgins Speech. EU. Retrieved 15 April 2013. ^ "Africa: Children's Investment Fund Foundation (CIFF) Leads Transformation of Global Nutrition Agenda with $787 million Investment". AllAfrica. 8 June 2013. Retrieved 9 June 2013. ^ Luke Cross (8 June 2013). "Hunger Summit secures £2.7bn as thousands rally at Hyde Park". Metro. Retrieved 9 June 2013. ^ Fiona Harvey and Karen McVeigh (11 September 2018). "Global hunger levels rising due to extreme weather, UN warns". The Guardian. Retrieved 27 December 2018. ^ Smitha Mundasad (11 September 2018). "Global hunger increasing, UN warns". BBC. Retrieved 27 December 2018. ^ a b "Organizing for action" (PDF). FAO. 2011. Retrieved 27 December 2018. ^ "Compact2025: Ending hunger and undernutrition - IFPRI". www.ifpri.org. ^ a b c Fan, Shenggen and Polman, Paul. 2014. An ambitious development goal: Ending hunger and undernutrition by 2025. In 2013 Global food policy report. Eds. Marble, Andrew and Fritschel, Heidi. Chapter 2. pp. 15–28. Washington, D.C.: International Food Policy Research Institute (IFPRI). ^ United Nations Department of Economic and Social Affaires. "Goal 2 .:. Sustainable Development Knowledge Platform". Sustainable Development Knowledge Platform. United Nations. Retrieved 6 October 2018. ^ Results Team of the Development Co-operation Directorate. "An SDG-based results framework for development co-operation". Development Co-operation Directorate of OECD. Organisation for Economic Co-operation and Development. Retrieved 6 October 2018. ^ "101 Global Food Organizations to Watch in 2015". Food Tank. January 2015. Retrieved 27 December 2018. ^ "7 Top Hunger Organizations". Food & Nutrition Magazine. 26 August 2018. Retrieved 27 December 2018. ^ Riches, G. (1986). Food Banks and the Welfare Crisis. James Lorimer Limited, Publishers. pp. 25, passim, see esp. "Models of Food Banks". ISBN 978-0-88810-363-5. Retrieved 19 December 2018. ^ "''The hunger project'', overview for Malawi". Thp.org. Retrieved 25 October 2013. ^ Fieldhouse, Paul (2017). Food, Feasts, and Faith: An Encyclopedia of Food Culture in World Religions. ABC-CLIO. pp. 97–102. ISBN 9781610694117. ^ "From the temple to the street: how Sikh kitchens are becoming the new food banks". The Conversation. 22 July 2015. Retrieved 3 January 2019. ^ Miriam Ross, (8 March 2012). "555 million women go hungry worldwide". World Development Movement. Archived from the original on 21 March 2012. Retrieved 31 July 2012. ^ "Mums missing meals to feed kids". The Daily Telegraph. 16 February 2012. Retrieved 31 July 2012. Hunger: an unnatural history (2006) by Sharman Apt Russell—rather than focus on the politics and economics of hunger, this work discusses the psychological effect on individuals and also explores the topic from an anthropological perspective. Wikimedia Commons has media related to Hunger.